Miscibility /mɪsɪˈbɪlɪti/ is the property of two substances to mix in all proportions (that is, to fully dissolve in each other at any concentration), forming a homogeneous solution. The term is most often applied to liquids but applies also to solids and gases. Water and ethanol, for example, are miscible because they mix in all proportions. By contrast, substances are said to be immiscible if there are certain proportions in which the mixture does not form a solution. For example, oil is not soluble in water, so these two solvents are immiscible, while butanone (methyl ethyl ketone) is significantly soluble in water, these two solvents are also immiscible because they are not soluble in all proportions. In organic compounds, the weight percent of hydrocarbon chain often determines the compound's miscibility with water. For example, among the alcohols, ethanol has two carbon atoms and is miscible with water, whereas 1-butanol with four carbons is not. Octanol, with eight carbons, is practically insoluble in water, and its immiscibility leads it to be used as a standard for partition equilibria. This is also the case with lipids; the very long carbon chains of lipids cause them almost always to be immiscible with water. Analogous situations occur for other functional groups. The straight-chain carboxylic acids up to butanoic acid (with four carbon atoms) are miscible with water, pentanoic acid (with five carbons) is partly soluble and hexanoic acid (with six) is practically insoluble. The same pattern exists for other molecules, for example aldehydes and ketones. Immiscible metals are unable to form alloys with each other. Typically, a mixture will be possible in the molten state, but upon freezing, the metals separate into layers. This property allows solid precipitates to be formed by rapidly freezing a molten mixture of immiscible metals. One example of immiscibility in metals is copper and cobalt, where rapid freezing to form solid precipitates has been used to create granular GMR materials. There also exist metals that are immiscible in the liquid state. One with industrial importance is that liquid zinc and liquid silver are immiscible in liquid lead, while silver is miscible in zinc. This leads to the Parkes process, an example of liquid-liquid extraction, whereby lead containing any amount of silver is melted with zinc. The silver migrates to the zinc, which is skimmed off the top of the two-phase liquid, and the zinc is then boiled away, leaving nearly pure silver. If a mixture of polymers has lower configurational entropy than the components, they are likely to be immiscible in one another even in the liquid state. Miscibility of two materials is often determined optically. When the two miscible liquids are combined, the resulting liquid is clear. If the mixture is cloudy the two materials are immiscible. Care must be taken with this determination. If the indices of refraction of the two materials are similar, an immiscible mixture may be clear and give an incorrect determination that the two liquids are miscible. Many games have a notion of magic potions, and some (such as Dungeons & Dragons) have "miscibility" rules for what happens if a character mixes them, either in vitro or in vivo. "Immiscible" potions commonly produce in-game effects such as explosions. 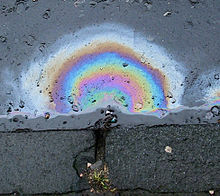 Wikimedia Commons has media related to Immiscible liquids. ^ Wade, Leroy G. Organic Chemistry. Pearson Education. p. 412. ISBN 0-13-033832-X. ^ Stephen, H.; Stephen, T. (2013-10-22). Binary Systems: Solubilities of Inorganic and Organic Compounds, Volume 1P1. Elsevier. ISBN 9781483147123. ^ Barber, Jill; Rostron, Chris (2013-07-25). Pharmaceutical Chemistry. OUP Oxford. ISBN 9780199655304. ^ Sangster, J. (1997-05-28). Octanol-Water Partition Coefficients: Fundamentals and Physical Chemistry. John Wiley & Sons. ISBN 9780471973973. ^ Gilbert, John C.; Martin, Stephen F. (2010-01-19). Experimental Organic Chemistry: A Miniscale and Microscale Approach. Cengage Learning. p. 841. ISBN 1439049149. ^ Mallinson, John C. (2001-09-27). Magneto-Resistive and Spin Valve Heads: Fundamentals and Applications. Academic Press. p. 47. ISBN 9780080510637. ^ Rich, Vincent (2014-03-14). The International Lead Trade. Woodhead Publishing. pp. 51–52. ISBN 9780857099945. ^ Webb, G. A. (2007). Nuclear Magnetic Resonance. Royal Society of Chemistry. p. 328. ISBN 9780854043620. ^ Knoll, Wolfgang; Advincula, Rigoberto C. (2013-02-12). Functional Polymer Films, 2 Volume Set. John Wiley & Sons. p. 690. ISBN 9783527638499. ^ Olabisi, Olagoke; Adewale, Kolapo (1997-03-19). Handbook of Thermoplastics. CRC Press. p. 170. ISBN 9780824797973. ^ Robert Wiese (2006-04-01). "I Wouldn't Drink That If I Were You: Potion Miscibility".